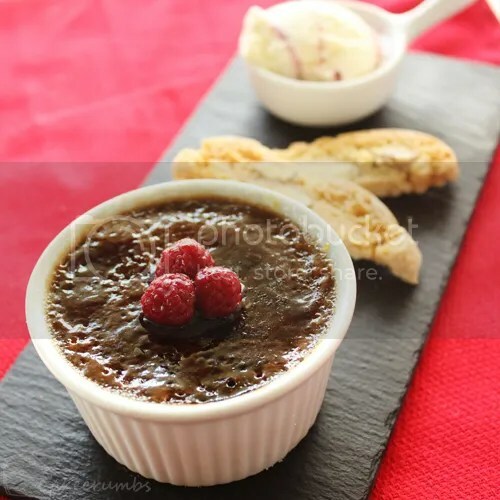 As with a regular brûlée, we begin by heating the cream and vanilla until it boils. Here's when the twisting begins. I made a chocolate and coffee paste and added it to the milk. While you let that infuse, you can tend to your egg yolks. 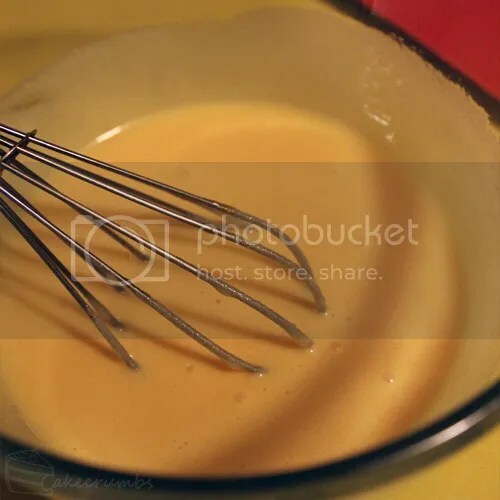 Whisk them with the sugar until the mixture is pale. Combine it all then fill up your ramekins. You'll have a lot of bubbles on the surface, so try to get rid of them before baking. 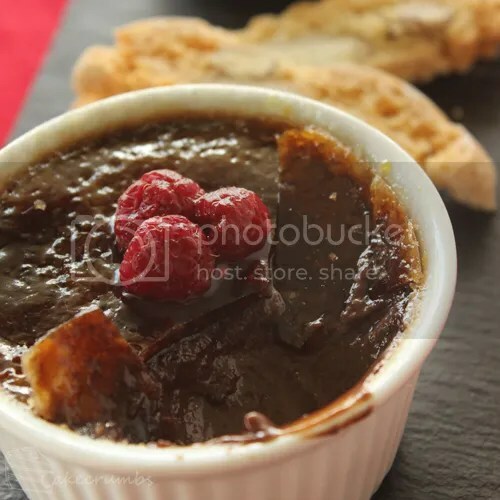 Leaving them there causes them to bake first and you get a weird bubble skin forming on top of the brûlées that can make it difficult to test for done-ness. If you have a blow torch that's the quickest way of popping them. If not you can use a spoon to skim them off the surface. I served these with some raspberries, almond biscotti and raspberry swirled ice cream. 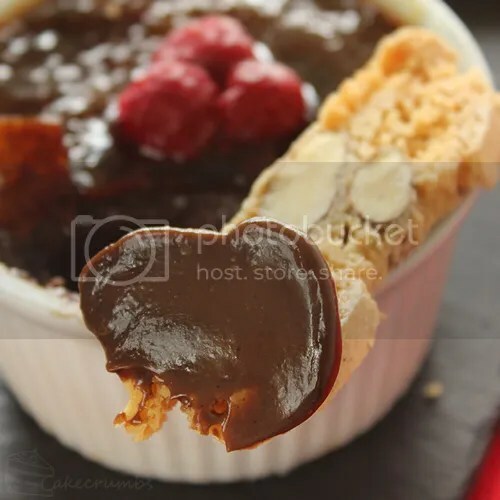 The toffee keeps the dark colour from the below custard, so be careful not to burn it. My favourite part: cracking them open. 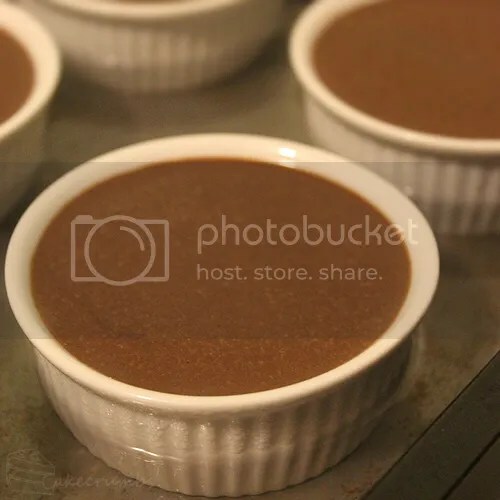 The resultant custard was perfectly smooth and incredibly delectable: a much better result than the last time I tried an overly complex chocolate crème brûlée recipe. Simple is enough. And simple can be incredibly delicious. This is a recipe that works in ratios. I've scaled this recipe to use the 6 egg yolks I had to use, but you can multiply or divide it based on how many yolks you need to use up. If you like a strong coffee hit, stick with the two tablespoons in this recipe. If you like a milder coffee flavour, you might want to stick with 1 tablespoon as it was very strong. 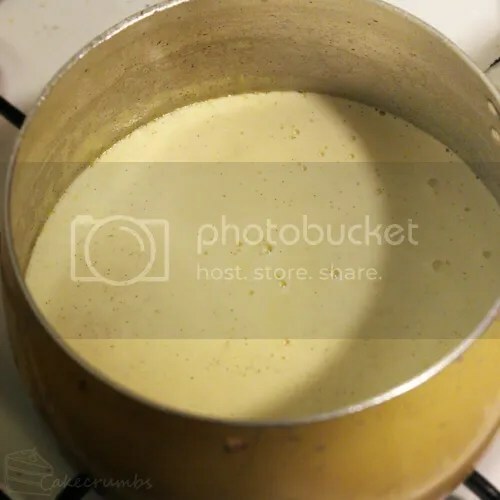 Place cream in small saucepan with vanilla bean paste and stir over medium heat until cream just begins to boil; remove from heat. 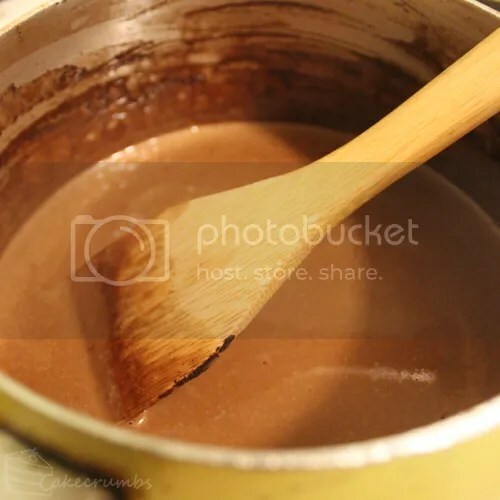 Mix coffee and cocoa with just enough boiling water to form a smooth paste. Add to the cream mixture and stir to combine; set aside for 10 minutes to infuse. Meanwhile, whisk egg yolk and caster sugar until light and creamy. I do love custard, but not as much as you. And I do love it when you make these. 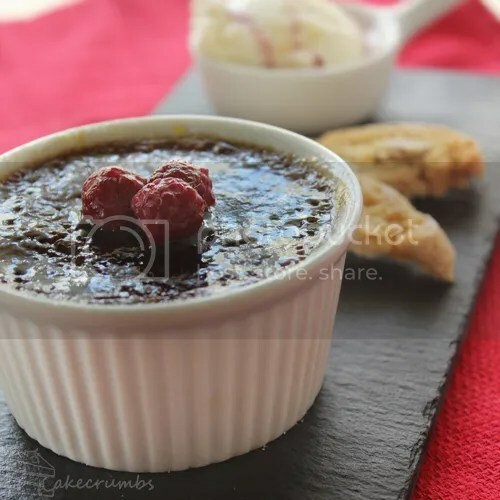 The combination of the creme brulee, biscotti and ice cream was just perfect.